Published: Sept. 20, 2016 at 11:57 a.m. Updated: Sept. 21, 2016 at 12:06 p.m.
MINNEAPOLIS -- It might have been only one game, but an undeniable message was sent on Sunday night. 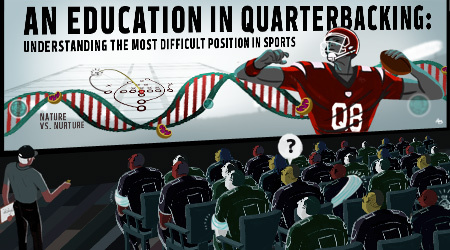 Minnesota Vikings quarterback Sam Bradford used the national spotlight to remind us all of his potential, as well as the reason why he's managed to keep finding work after so much turmoil. When he came to this franchise just over two weeks ago, it seemed like an impulsive response to a catastrophic emergency. Today, it feels like something more real, more rewarding -- the type of blessing that nobody saw coming when Minnesota's season was on the verge of early collapse. The Vikings acquired Bradford in a trade with Philadelphia on Sept. 3 because they lost their former starting quarterback, Teddy Bridgewater, to a freakish knee injury. Now, two games into the season, star running back Adrian Peterson is sidelined indefinitely with a torn meniscus in his right knee. Normally, this would be the time for any franchise to start thinking about the 2017 NFL Draft. Instead, the Vikings should be thinking about all the possibilities that now exist, because Bradford's debut was literally that impressive. It wasn't merely about the numbers he produced in Sunday night's 17-14 win over Green Bay (Bradford completed 22 of 31 passes for 286 yards and two touchdowns). This was about the way he dropped passes into tight coverage, the ease he displayed in firing darts across the field, the toughness he revealed when he went to the locker room in the first half with an injured left hand and returned to do even more damage. Bradford also thrived as the Vikings were christening the new U.S. Bank Stadium against their hated NFC North rivals. It was the type of performance that put Minnesota right back into the conversation as postseason contenders. It also said something that Bradford was more eager to celebrate his teammates than his own success in such adverse circumstances. "The guys here have been awesome," Bradford said in his postgame press conference. "Any time you join a new locker room, it's not easy at first. But these guys have had my back since Day 1. [Backup quarterback] Shaun Hill has been right there with me the last two weeks, every step of the way. He was with me with a previous team, so he can relate things [about this offense] back to what we did in the past. All the guys have been great, and I just wanted to come out and play well for them." This is the best Bradford has looked in years. He played well in the second half of last season, but most people likely remember how that year started, with Bradford struggling to find his way in the offense run by former Eagles head coach Chip Kelly. Before that, Bradford was best known for his health problems in St. Louis, when he missed all of the 2014 season and nine games in 2013 because of two ACL tears in his left knee. Bradford was well on his way to journeyman status in the league. He'd already seen the Eagles give up on him after they selected Carson Wentz second overall in this year's draft. This is why Bradford -- who cost the Vikings a first-round pick in next year's draft and a conditional later-round selection in 2018 -- deserves ample credit today. Critics bashed him for being brittle. They scorned him when he couldn't live up to the trade that brought him to Philadelphia. He also absorbed ample abuse when he signed a two-year, $36 million extension with the Eagles and then became angry after they made a blockbuster deal with Cleveland that led to the drafting of Wentz. (Bradford voiced his displeasure by demanding a trade and skipping part of Philadelphia's offseason workout program.) But the man never lost his faith, his focus or his fight. 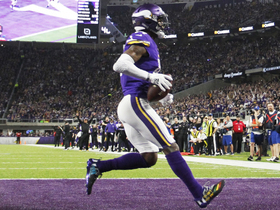 That much was apparent when Bradford threw a 25-yard touchdown pass to Stefon Diggs just three plays after Peterson hurt his knee in the third quarter. That score gave Minnesota a 17-7 lead and represented the type of game-changing plays Bradford made all night. Head coach Mike Zimmer even sounded pleasantly surprised at how well his quarterback performed in such a difficult situation. He wanted to give Bradford some snaps in Week 1's 25-16 win at Tennessee -- Hill started instead -- but the opportunity never arose. When asked after Sunday's win when he knew Bradford was ready, Zimmer said, "How do you know if a guy is ready? I knew he could throw the ball pretty darn good. He knew the offense pretty good. He could call the plays out and he knew the protections. I don't know if there was ever a point where I said [he's ready], but we are going to ride with him." The irony of Sunday night is that Bradford also looked better than Bridgewater ever has in his two years of running the Vikings' offense. 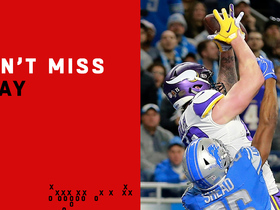 Bradford was sharper, more capable of producing explosive plays and fully in sync with Diggs, who finished with nine receptions for 182 yards and a touchdown. When Bridgewater was lost for the season, it was logical to think the Vikings' best chance of winning games came down to the same formula that led to their NFC North title last year: running the ball, playing tough defense and eliminating mistakes. 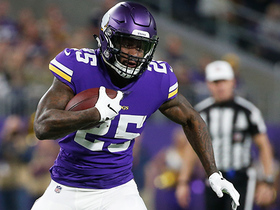 Bradford's performance opened the door to the possibility that Minnesota doesn't have to be nearly as cautious as we once thought. This isn't to say Bridgewater's job is in trouble. It's simply apparent that the price of acquiring Bradford from Philadelphia indicates that the Vikings have to be concerned about how long it will take Bridgewater to recover from an injury that traumatized many of the teammates who witnessed it. If Bradford can keep playing as he did on Sunday, the Vikings might have to ask themselves some tough questions down the road. For the moment, they should feel fortunate that they found a 28-year-old former Offensive Rookie of the Year who wasn't ready to give up on himself. Bradford did acknowledge that there is still plenty of work to be done on his end. 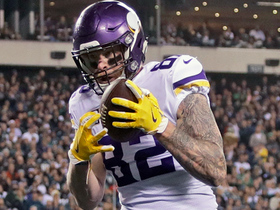 "When you've been in a system for a while, there's a lot more focus on what the defense is trying to do, how they're going to try to stop us," Bradford said. "This [past] week [of preparation], there was still a lot of focus on what the defense was doing, but there also was a lot of talk about what we were doing. I'm still in a phase where I have to translate things to what they were in a previous offense. That's how my brain functions. The longer you're in an offense, the smaller that translation becomes from week to week." Bradford basically was saying that not every game is going to look as great as the one he produced against Green Bay. There will be some ups and downs, and there will be days when the Vikings will have to rely more on that rugged defense that stifled Packers quarterback Aaron Rodgers most of the night. Bradford still hasn't even spent a month with his current employer. He's been around the NFL long enough to understand the regular season is a marathon and not a sprint. The good news for the Vikings is that Bradford finally seems to be back in a mental state that once created so much hope about him, back when he was the first overall pick in the 2010 NFL Draft. He couldn't make good on that promise in St. Louis, and he left Philadelphia as the odd man out after one season. Now Bradford finds himself with a franchise that needs a beacon of hope at a time when two of its biggest stars are hurt. Thus far, it already feels like the ideal spot for him to prove that there's still plenty to like about his own future.